Jade is a 13 ½ year old F/S Pitbull Terrier mix. I treated her for multiple leg lameness, most pronounced at her left front leg. She is a very nervous patient and everything needed to be done in a gradual, slow manner. Jade responded very well to her acupuncture sessions. She was very relaxed and sleepy towards the end of each session. Her owner reported that she was more perky and willing to walk. She also noted that the left front leg lameness was improved, although still always present. Jade is a 13 ½ year old F/S Pitbull Terrier Mix. She was adopted as a puppy by her current owner. She has a history of severe allergies, anxiety, bilateral TPLOs (left in 2014, right in 2015), hypertension, and degenerative joint disease. She has been allergy tested and treated with allergy injections. She also sees a holistic DVM once a month. 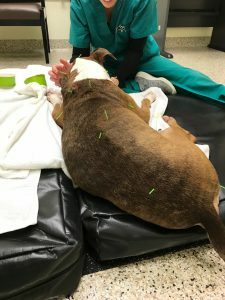 She has had acupuncture before and her owner reports that she “tolerated it”. Her owner remembers that the needles were silver in color. Jade has had a progressively more difficult time walking over the past several years. She has had a lameness at her left front leg for at least two years. She will often not want to walk and her owner will carry her. Her owner is a canine massage therapist and tries to massage Jade at home once weekly, although this is inconsistent. Jade has also developed a finicky appetite. Jade’s owner would like to try acupuncture to improve Jade’s quality of life. Abdomen: There are no masses and no fluid wave palpated. All structures palpate within normal limits. Musculoskeletal: There is multiple leg lameness – most pronounced at the left front leg. She stands with both elbows abducted, elbow flexion is decreased bilaterally. Jade is uncomfortable on palpation over the biceps tendon bilaterally. There is mild lordosis. There are prominent dorsal spinous processes. There is generalized muscle atrophy. Both stifles are mildly thickened. Hip extension was not performed today to avoid patient stress. Jade can transition from a stand to a down and vice versa without support. Myofascial Exam: Jade’s muscles are generally tight and there is generalized muscle atrophy. There are multiple taut bands at the cervical spine and Jade is sensitive at the caudal cervical spine at C4-C7. There are taut bands in the biceps bilaterally in addition to the bilateral supraspinatus and infraspinatus muscles bilaterally. There are taut bands cranial and caudal to the scapula bilaterally. The rhomboids are tight. The quadriceps are also tight bilaterally. My initial acupuncture approach was based on what Jade would tolerate. She was initially very sensitive to the needles and very gentle palpation so her first session did not have a lot of points. I started with central, calming points and then worked on her painful joints and areas of myofascial restriction. At her third session, I was able to use slightly larger needles and Jade tolerated them very well. As we progressed, I tried to incorporate more points for her non-orthopedic issues (allergies, hypertension, and anxiety). Jade showed progressive improvements in her willingness to walk after each acupuncture session. She even started trotting for a few steps at a time after her second acupuncture session and her owner has to carry her less frequently. Her owner reports that Jade is perkier at home since starting acupuncture. The lameness at the left front leg has improved but is not resolved. As acupuncture is the only change to Jade’s treatment plan, I attribute her improvement to acupuncture. Jade was initially very anxious – she was shaking and fearful at the start of her first acupuncture session. She fell asleep by the end of her first session and over time became very comfortable during her sessions. Based on Jade, I think further research on acupuncture for canine and feline orthopedic pain is in order. 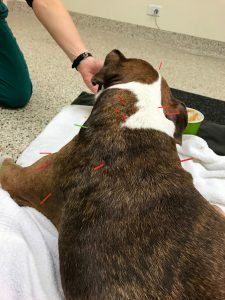 Research on acupuncture for canine anxiety in and out of the hospital setting would be beneficial. Additionally, Jade has had acupuncture before but never relaxed for it so research on needle size and stress to the patient may be indicated. Lane, David M. and Sarah A. Hill. “Effectiveness of Combined Acupuncture and Manual Therapy Relative to No Treatment for Canine Musculoskeletal Pain.” The Canadian Veterinary Journal. 2016 Apr; 57(4): 407-414. Nuno E.O.F. Silvia, Stelio P.L. Luna, Jean G.F. Joaquim, Heloisa D. Coutinho, and Fabio S. Possebon. “Effect of Acupuncture on Pain and Quality of Life in Canine Neurological and Muskuloskeletal Diseases.” The Canadian Veterinary Journal. 2017 Sep; 58(9): 941-951.